When John Christakos, Maurice Blanks, and Charlie Lazor graduated from Williams College back in 1987, the trio ran into a problem that many new grads can relate to: They were ready to upgrade their post-grad furnishings but found that furniture shopping was hard. Out of that frustration, Blu Dot was born. We wanted to know more about the company's origins, so we invited Blanks and Christakos to come to Hunker House in Venice, California, to chat with our VP of Content, Eve Epstein about Blu Dot's history, as well as the company's success in light of its 20-year anniversary and release of a new book, Less Is More (Difficult): 20 Years of Design at Blu Dot, published by Rizzoli. "When we were looking for modern furniture for our first apartment, we were not able to afford what we liked and not liking what we could afford," Blanks told us. "For most modern furniture, you had to have a secret handshake; it was made in Europe, took 16 weeks to get, and cost $20,000." 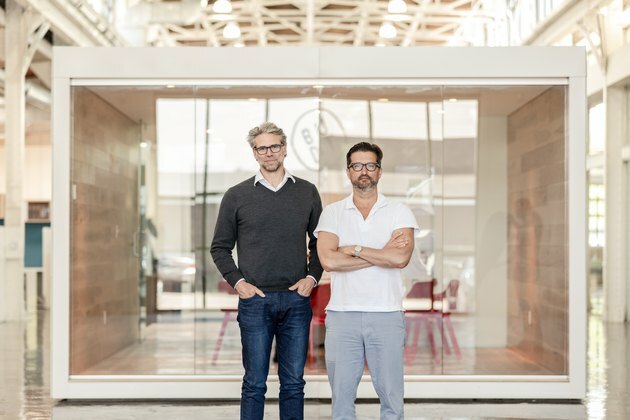 Now considered a go-to for reasonably-priced modern furniture, Blu Dot's founders also describe how the company has still retained the approachable aesthetic that drove its popularity to begin with. "Everyone's invited to our party. We never as a company or a brand want to be too cool for school," said Christakos.